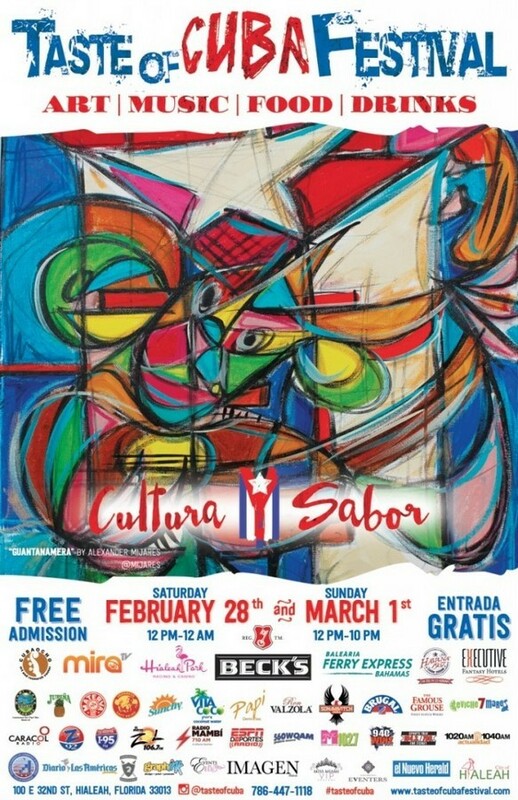 The Taste Of Cuba festival is this weekend at Hialeah Park and they donated a space to Life Is Art! Come out, see artist Ileana Collazo painting live, register for a chance to win an original piece of art, and enjoy some true traditional Cuban cuisine, music and entertainment. Entry is free! Free Parking! What makes Taste of Cuba unique from other events in the South Florida area is that it will allow guests to experience traditions only found in Cuba. Everything one will see, hear, taste, and embark on an experience, that will take them back to a time where Cuba influenced and enriched Miami society. Classical foods such as lechon asado, carne con papa, rice and beans and yuca will be sure to tantalize your taste buds. Enjoy typical Cuban beverages while being engulfed in the Africana beats of the country. Besides exquisite foods and drinks that will be offered, guests can also enjoy a simple and delicious cafe con leche. Cigars will be hand rolled at your request and finished in time for you to peruse the Art Walk that is right next door. Along the river, local artists will be displaying their masterpieces for the public to enjoy. An exclusive asset to Taste of Cuba is the luxurious VIP area where guests can indulge in all you can eat food, drinks and smoke cigars. VIP guests will receive a badge and be exposed to the ultimate Cuban experience.